This sounds yummy... well, probably not... I really like the illustration and the story behind it. Oh, and the mole man is super cool to. 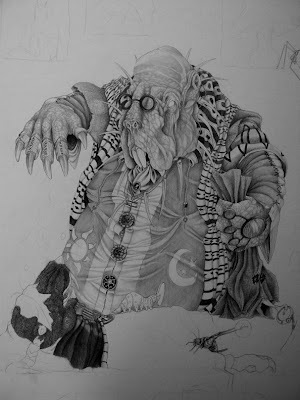 oops I called him Walrus Man, i mean Mole Man :) all the bugs are amazing too! Excellent concept. I think I'll celebrate your success without that beverage though. Mole Man is un-B-lievable. really, really great pencil magic. It makes me want to do more of it. I do love a good old drawing pencil. Moleman is a thing of beauty and exquisite detail. Love it. Those cell mates are indeed innovative, did you get try the fruits of their labour? Love the cartoon and Moleman. When I hear stories of things guys get up to in prison, I always feel sad that this kind of creativity and resourcefulness wasn't put to better use when they were in the outside world. I've only ever visited prisons, but I know several people who have been inmates. I digg the Mole Man Brian... the fermented bag juice chilled in the loo....not so much... lol! after saying, yuk...this reminds me of the time our black lab got drunk from fermented figs. in the garage, a bucket of figs left over from canning, and covered (though not actually sealed) apparently juiced right up into a doggy wine of fig. [today's word verification - grown] nope. not me. I love the wrinkles in mole man's coat...and the buttons. great details. Brian, the moleman is insane! That is just awesome. too funny~! and I LOVE the moleman. thanks for the blog comment! Your illustrations are so creative. I love them! all I can say is "wow!" for the moleman. 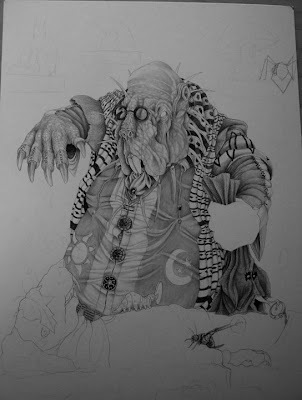 The mole man is wicked... very cool stuff, can't wait to see the finished piece. Keep posting him as you progress! That's an original take on celebrate! Very funny - but not a recipe I'll be taking, thanks! Moleman continues to get more amazing. Brilliant! That is just plain sick, but a guys gotta do what a guys gotta do. That Moleman is looking awesome. ew.... what a lovely pen and ink below... but ew. one would have to be trusting of their prison mate to do this. ew. Wow, that is so sick and yet so fascinating (many sick things are, hee hee.) 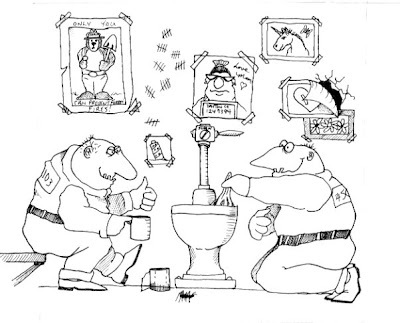 Great cartoon and maaaaan, that Mole Man... sheepers, is your pencil work freaking fantastic or what?! I don't come by here enough. I need to savor this line work of your more often! The moleman is looking quite excellent Brian! As for the prisoners, I've seen plenty of episodes of Lockup and am still amazed at how jail can bring out the creativity in criminals (haha)! fantastic characters! also love your seahorses! I'm flabbergasted. Definitely, the human being is able to find solutions to almost anything. Wow! Also, I'm amazed for your talent and dedication. What a wonderful creature you are working on now! That's wild! I never would have guessed the inmates would be up to something quite so dastardly... er, actually, I guess I would. Regardless, nice comic. I especially like the posters. The unicorn really cracks me up. On the flip-side, the Moleman is really coming along nicely. It looks pretty incredible. I'm not sure I'd have the patience to work with details the way you do. I can't wait to see the finished product.